Outdoor activities and music. This lively coastal town is starting to wake up after a long winter. 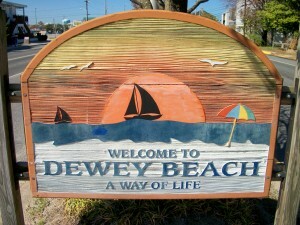 If you are at the Delaware Beaches, this is what you will expect to find in Dewey. Saturday, 4/30 – It’s a Town-Wide Yard Sale. Homeowners and property owners are participating in this event and extending you an invitation to come and shop throughout Dewey Beach. It is a Treasure Fest Community Yard Sale beginning at 9:00 a.m. until 1:00 p.m.
Saturday, 4/30 – It is the 6th Annual DoodlesinDewey. It will meet at Saulsbury St. at 9:30 a.m. This event is for the whole family to enjoy and participate. 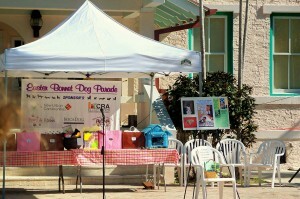 Watch dogs run free, buy raffle tickets or just enjoy your time at the beach. All proceeds benefit Food and Friends organization which delivers food to home-bound men and women. More info? Check these 2 websites; www.foodandfriends.org and www.doodlesindewey.com. 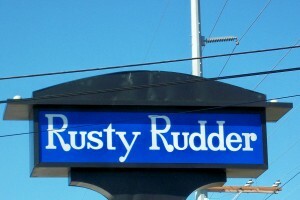 Saturday, 4/30 – Rusty Rudder, 113 Dickinson St. and On the Deck at 3:00 p.m. is the very loved The Greaseband. 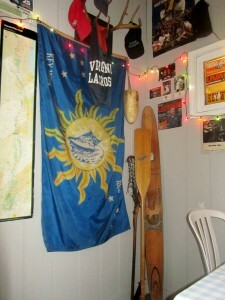 This is one of those bands that have a big following at our beaches and have been around for a long time. They put up quite a performance. Later, in the evening, at 9:00 p.m. the performers will be Kristen and The Noise. If you are wondering about the deck, do not worry because it is tented and heated. Gorgeous day!! Nothing better than being at the beach. 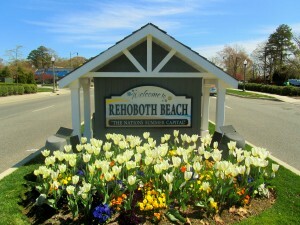 If you are visiting Rehoboth Beach, you might want to take advantage of some fun events from entertainment to walks for good causes. 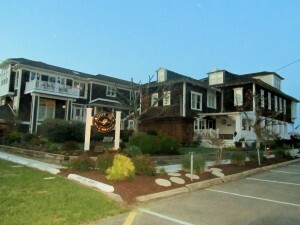 Friday, 4/29 – Spaghetti Dinner and Dance – To benefit Meals on Wheels of Lewes and Rehoboth Beach. 6:00 p.m. until 9:00 p.m. Venue? Aqua Grill, Baltimore Avenue. Tickets at the door will be $15 for adults and $9 for children. Entertainment by Viki Dee. There will be a cash bar available. More info? Please call 302-645-7449. 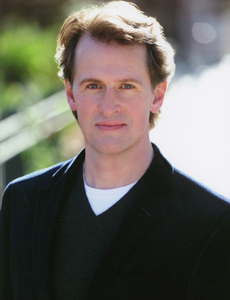 Friday, Saturday, Sunday, 4/29 – 5/1 – Ted Keegan, a veteran of Broadway’s The Phantom of the Opera will be singing the great composers. The venue? Clear Space Theatre, 20 Baltimore Ave. in Rehoboth Beach. On Friday and Saturday it will start at 7:00 p.m. and on Sunday it will start at 3:00 p.m. $25 for the general public, $20 for seniors, $15 for students, and $5 for children under 12. More info? Visit www.clearspacetheatre.org. You can also call 302-227-2270. 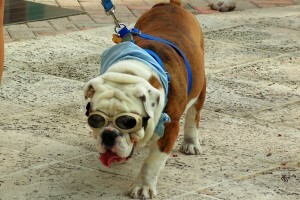 Saturday, 4/30 – Balk to the Boardwalk – Walk for the Animals. 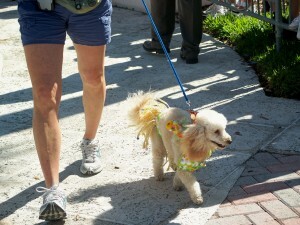 It is the 8th Annual Walk for the Animals at the Beach, at the Rehoboth Beach Boardwalk. Registration begins at 11:00 a.m. The Walk starts at Noon. 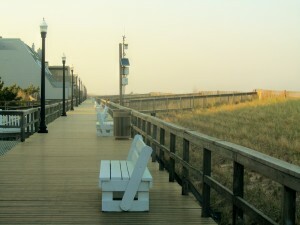 Length of the Boardwalk and back is 2 miles. 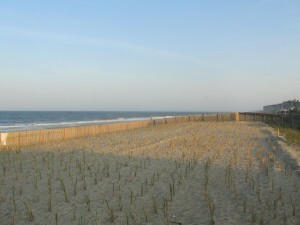 For more information, please visit www.dehumane.org/beachwalk. You can register online and check what the Delaware Humane Association is all about. 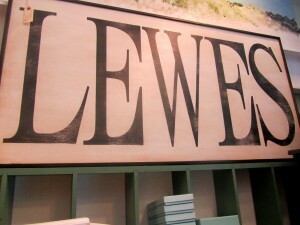 The Historic town of Lewes is getting ready for a celebration on Friday, 4/29. It is called Fun Friday. Lewes is celebrating the Royal Wedding. I wrote a post on the different events throughout this special day. You can read it by clicking on the month of March, 2011 on the left hand side of this website and then scrolling down to the 9th. 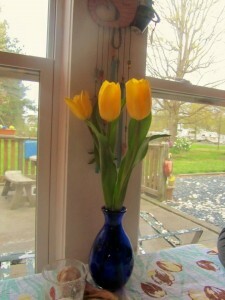 “Friends are the flowers that never fade.” With that in mind I went to meet Jody on Tuesday in Lewes, Delaware. I met Jody not long ago; an instant friendship. She is funny, likes to talk and likes to try new restaurants, as well. About 3 weeks ago a new restaurant opened in Lewes. When I first heard about it I thought it was only a bakery. This new eatery is the perfect combination; a bakery, a restaurant, and a bar. Sounds like heaven. Their motto? “Come for Dessert, Stay for Dinner”. 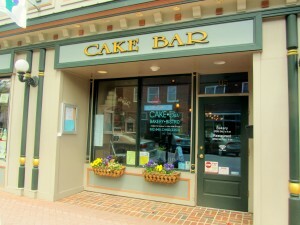 Cake Bar is located at 115 Second St., Lewes, Delaware 19958. Tel. 302-645-CAKE (2253). Website? www.sugarbakerscakes.com. What a difference!! 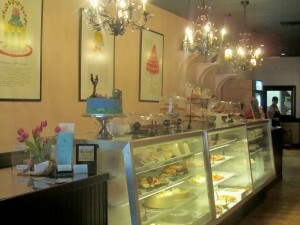 As you come into Cake Bar from the Second St. entrance I was pleasantly surprised. The bakery is at the front. 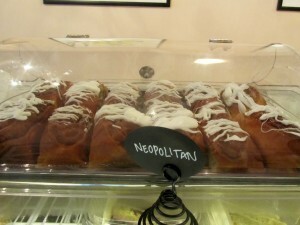 Nothing like looking at beautiful baked goods in a warm atmosphere to wet your appetite. Jody and I met Jamie, the owner. Friendly; like you know her. She told us that she and her family had been coming to Lewes for a long time and that they owned a home in town. They were looking for a place to start a business and when the opportunity came they grabbed it. Right in the center of town. 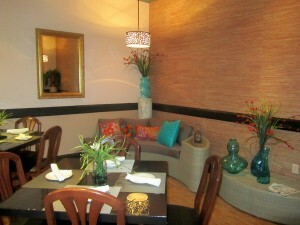 I like what they have done with the dinning areas. It was comfortable and a good choice of colors. But that is not all, Jamie and her family own a very successful business in Catonsville, Maryland. 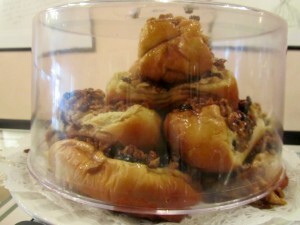 It is called Sugar Bakers Cakes at 752 Frederick Rd., Baltimore, MD 21228. 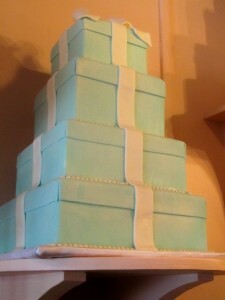 The website is www.sugarbakerscake.com. The tel. is 410788-9478. In business since 1996, this company has made a name for themselves. Please check their website to see the most amazing cakes for all occasions. The reviews? Awesome!! Appearing in The Today Show and Whose Wedding is It Anyway?. Their cakes are delivered to Baltimore, Washington, and to the Maryland and Delaware resorts. 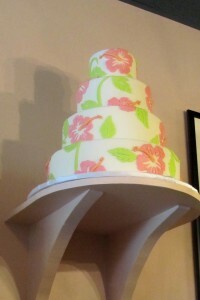 You can contact them either in Baltimore or in Lewes for a complimentary wedding cake consultation. June is around the corner, so I hope brides to be are reading this post. One thing that caught my attention was that you can call Cake Bar and order dessert trays; 10 person minimum for all trays. Just cookies, or a selections of brownies, blondies, and mini desserts. Served in easy to handle, bite size pieces. The Fancy Feast includes mini eclairs, tiny mousse cups, fresh fruit tarts and dipped strawberries, among others. You can also order miniature desserts by the dozen. Just give them a call if you would like more info. Remember their number is 302-645-CAKE. Jody and I checked the menu. Cheeses, Maryland Crab Dip, fries with garlic truffle aioli, wings, mac and cheese, shrimp cocktail, steamed shrimp, steamed mussels are a few of their starters. Then the soups and salads followed. Sandwiches like Maryland Crabcake, the Delaware Dip, the BLT and G(uacamole) which had thick smoked bacon, roasted and sandwiched with arugula, juice tomato, and creamy guacamole. The Hot Dog Muffaletta is their take on New Orleans; a big, grilled all-beef dog in a baguette roll, packed with pepperoncini’s, red onion, roasted red pepper, provolone cheese and tapenade. 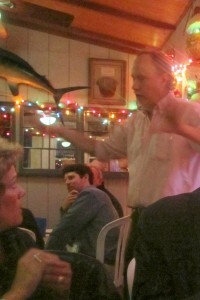 Some of their entres were shrimp and grits, day boat scallops, fresh daily fish, flat iron steak, meatloaf and mash. The Delmarva Chicken is a Delaware chicken brined in traditional local marinade of lemon, buttermilk, garlic, olive oil and seasonal herbs and then roasted. Choice of garlic mash or fresh veggies. Jody and I decided on a salad. You know how it is, summer is around the corner, afterall. Jody chose the CakeBAR Salad which had lettuce, cucumber, tomato, sweet red pepper, red onion, olives, artichoke hearts, and goat cheese Feta, with red wine vinaigrette. She topped it with grilled shrimp. It was light and she very much enjoyed it. I chose the Wedding Salad which had baby greens topped with seasonal fresh berries, toasted pine nuts, crumbled goat cheese and house-smoked duck confit. 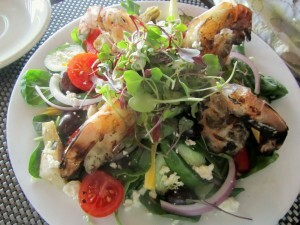 Served with a honey citrus vinaigrette. I loved it. 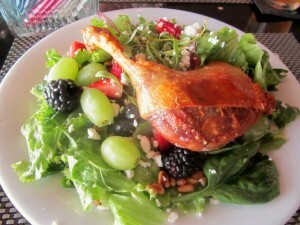 I think the combinations of all the fruit, the smoked duck and the dressing were a perfect marriage of flavors. No dessert for us. Can you imagine? All homemade and we had the willpower to say no. Our waiter, which by the way was very good, named them all. We still resisted. I wish Jamie and her family the best. Stop by and say hello. Note: Fun Facts from Sugar Bakers Cakes: They use 75,000 eggs per year and 1.8 million chocolate chips per year. Yikes!! 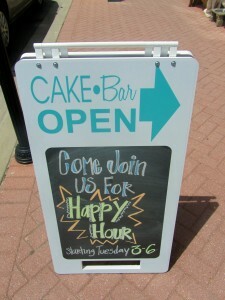 Please remember that Cake Bar has happy hour. I wonder what those founding members of Bethany would think of the town now? I think they would be so proud. The town was founded by members of the Christian Church from Washington, D.C. and Pennsylvania. Bethany has stayed true to what these settlers had in mind so long ago. A town that still reflects their character; they were looking for “a haven of rest for quiet people”. It is still that way. A quiet, family town by the beach. Still some of the old beach houses remain in town. Small streets, quaint shops. I lived in Bethany for years. My children grew up there. The town and the beach were their playground. It was great. Over the years, major groceries stores have come to town, more traffic and more development. The town is not a “dry” town anymore. On Monday evening at 7:00 p.m. I arrived in Bethany. I wanted to see how the town looked after a hectic and busy week. 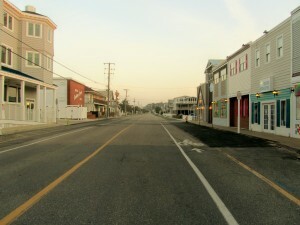 Usually, at this time of the year, the beach towns settle after a holiday week-end. So was the case on Monday. 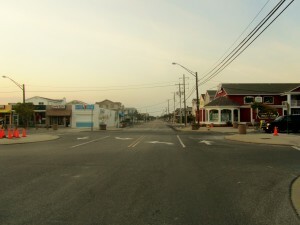 I was coming from Rehoboth Beach and turned left into Garfield Parkway, which is the Main Street in “downtown Bethany Beach”. 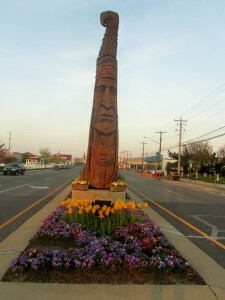 The Totem Pole is always guarding that entrance. You cannot miss it; imposing is the word. 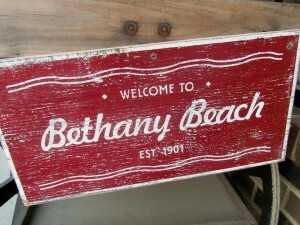 For the past years the beautification of Bethany has been praised. The people working on this effort should be commended. The town looks good; pretty. More so as the sun was setting. 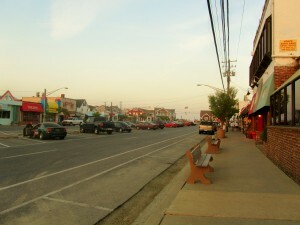 The last street before you hit the Boardwalk, Bandstand and the beach is called Atlantic. I looked North and there was not a soul; the same when I looked to the South. Everyone did go home!! On the Boardwalk and Bandstand there were a few people; leftovers from the week-end. 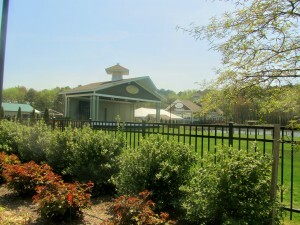 From Memorial Week-End to Labor Day you will find live entertainment at the Bandstand. It is usually, Fridays through Sundays. Performances start at 7:30 p.m. unless otherwise stated. For this info. you can call 302-539-5484. 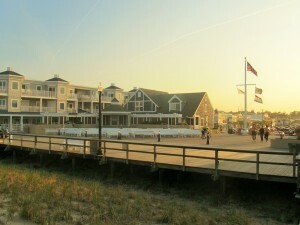 On May 7th, rain or shine the event called Bethany Beach Breast Cancer Fun Run/Walk will take place. 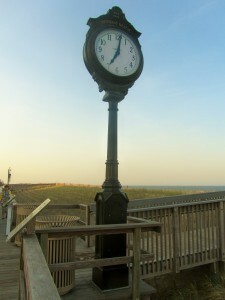 Check in is at 8:00 a.m., by the Boardwalk. The 5K Fun Run will start at 9:00 a.m. and the 3K Walk, at 9:10. 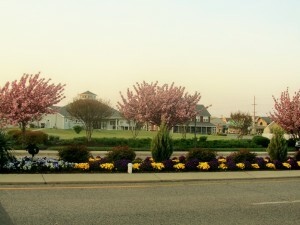 For more information, please visit http://www.bethanybeachbreastcancer.com. To kick off the Memorial Week-end, the entertainment for Saturday will be USNA Electric Brigade, which is the Navy’s Premier Pop Music Ensemble. On Sunday, US Army Volunteers, will be performing. 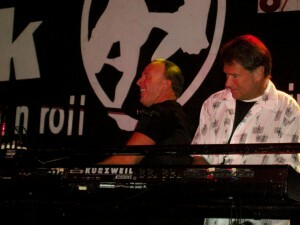 They are the United States Army’s premier touring show band. I continued on my sunset strolling tour through the empty streets. I finally got to the Addy Sea Bed & Breakfast. 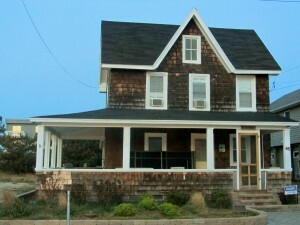 This is an elegant Victorian beach front B & B. “The 4th of 5 houses built by John Addy from Pennsylvania. Considered his masterpiece, it was one of the first homes to have indoor plumbing. In 1935 it was converted into a guest house and now it operates as a very popular B & B. Weddings, parties, etc. are scheduled way in advance. For more info. 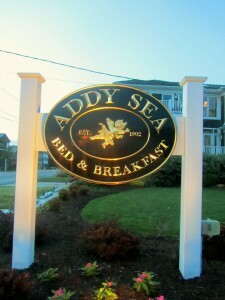 please visit www.addysea.com. Then I got to 5th street, which is on the north part of town. That was the beach that I took my kids to. It was at the end of town and in many ways very private. The path towards the beach looked the same. 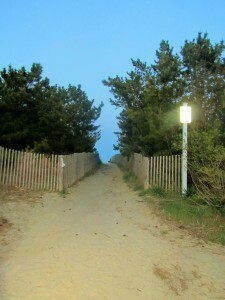 Throughout Bethany, access to the beach looks like this from the side streets. 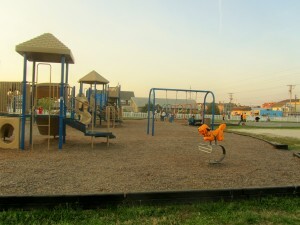 Right in town there is a recreation park; basketball courts and a tot lot. 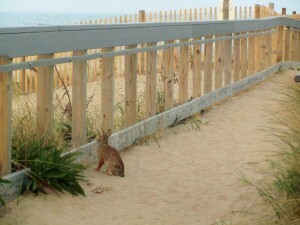 Then I came to find a beach bunny as I was going to the beach. He just stood there. Not afraid, either. So cute. 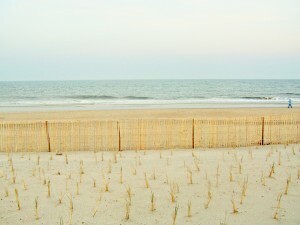 The beach looked pretty; the dunes protecting the town. It was a peaceful walk; pretty soon the gates will open and the visitors will start arriving. It is so good to see them come; but I do enjoy the solitude of the second season. Talk to you later…have a good one. 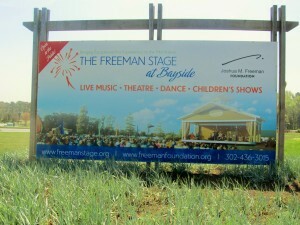 I was out and about today with no direction in mind when I decided to visit The Freeman Stage in Selbyville. 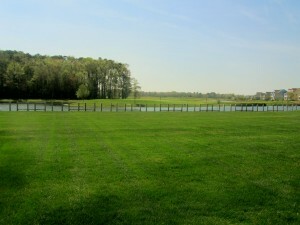 This outdoor art venue is located at 31750 Lakeview Drive, Selbyville, DE. If you are at the Delaware or Maryland Beaches the best way to get there is to travel on Ocean Highway to Fenwick Island. At the intersection of Rt. 54 then go west for about 4 miles. When you see Harris Teeter turn towards it. 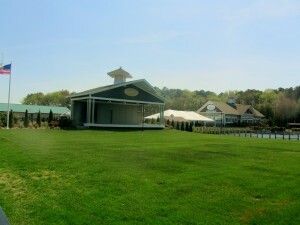 It is also the entrance to Bayside, a golf community on the water, and where The Freeman Stage is located. Upon entering the Bayside community then proceed straight on Americana Parkway. The outdoor theatre is on Town Lake at the intersection of Americana Parkway and Lakeview Drive. Last year I had mentioned a few of the live entertainment that were on the schedule. After seeing how pretty it was today, I am definitely attending some of them. It must be gorgeous on a balmy summer night. It is an outdoor setting; not a big stage. You can bring your lawn chairs, bug spray and blankets but leave behind your pets (unless service dogs are assisting patrons with disabilities) and your alcohol. If you wish to purchase alcoholic beverages, then do so at the Freeman Stage Cafe. No smoking, as well, and no recording equipment and cameras during the performances unless by authorized press and personnel. 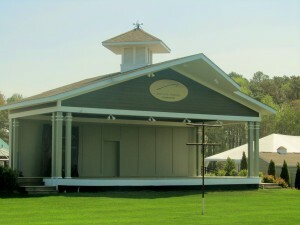 The summer event calendar is out and you can take a look at it by visiting www.freemanstage.org. If you decide you want to attend a performance, you can buy tickets through the website. You may also purchase general admission tickets for $10 per person, per performance when the gates open at 5 p.m. The website has all that info. and more. If you need to call them, please do so at 302-436-3015. You can find them on Facebook. One thing to remember is that since this is an outdoor venue, it is subject to the weather. You can visit their website for cancellations or call the above mentioned telephone number. This will be their 4th season and the opening act will be on May 28th with a Memorial Day celebration featuring Zany Umbrella Circus. It will be for the whole family. Patriotic celebrations will highlight the day; circus illusions and acrobatics. It will be on that Saturday of the Memorial week-end starting at 12 p.m. until 3 p.m. It will be FREE!! If you are a fan of LeAnnRimes, then she will be appearing on Saturday, 6/25 at 8:00 p.m. Tickets are $40 plus. The Freeman Stage is inviting all of us to spend an intimate evening under the stars with one of the biggest country stars. You will be impressed with their schedule; a little bit for everyone to enjoy. Have a great day…I am still digesting my Easter meal; I feel sluggish. I really don’t mind driving distances to go to a good and unique restaurant. I do mind waiting in line to get into a restaurant, though. 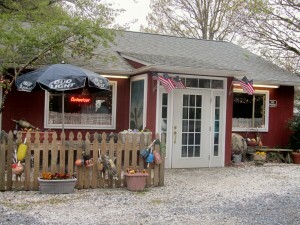 And with that in mind my husband and I went to meet Ross and Cindi at The Grove Market in Bishopville, Maryland. 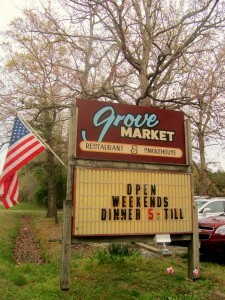 The Grove Market is at 12402 St. Martins Neck Rd., Bishopville, MD 21813. Tel. 410-352-5055. No website. And, if you are planning on having dinner there, bring cash or check. No credit cards are accepted. That being said and done, the next step is you have to go through the process of getting a reservation. All you have to do is call. But don’t expect to get a reservation that pronto. Well, maybe, if you are lucky or have a good friend like I do. Even though I think Leslie, the owner, knows me now. When you call, leave your request and I would even leave a second choice for time and day. The Grove Market is very small, and so popular. Be patient. I have written a couple of times about it and questioned if it has been worth going through the “ordeal” of making the reservation. Every time the answer is, Yes!! It is that good. This was their opening week-end for the new season. From Rehoboth Beach it takes about 45 minutes. Go Ocean Highway until the Rt. 90 Bridge. Take that exit and continue to the next light. Turn right on St. Martins Neck Rd. and continue driving for about 1 1/2 miles. It is on the left hand side of the road. A tiny little place. Check the picture so that you can remember it. It was packed, but Leslie moved her patrons quickly. Don’t expect to stay there forever. The Grove Market looked good; all spruced up for the season but always keeping that look that makes it so unique. 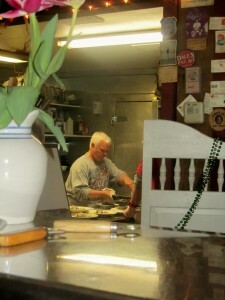 I was so happy to see that John McDonald was at the helm of the tiny kitchen. He is a fantastic chef. We were seated in the back room which I really like; only 3 tables and backyard view. It is funky. There were lights and signs and, wow, also flowers on the table. Yes, the tables are plastic, and the tablecloths are faded. That is why you go there; so different, but the food is the icing on the cake. 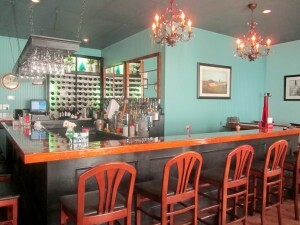 In the back dining room, your waiter will take your order for beer or wine. Bottled water is available, as well. Then, the waiter will announce the appetizers. There is no written menu, did I tell you that? Everything is from memory. Plenty of appetizers for the size of the restaurant. I could not copy one thing down so bear with me and check the pictures. 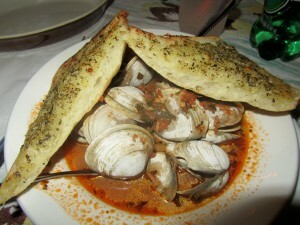 I chose the clams in a very well seasoned broth. Thank God they brought a spoon. All gone, it was. 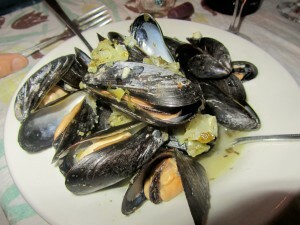 My husband chose the mussels. I was surprised because he never orders them. I am the one that loves them. Just as good as my clams. Cindi had the soup. 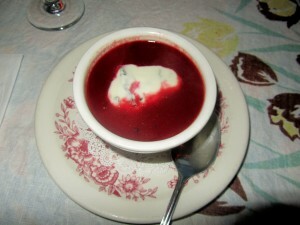 This was a beet and tomato soup. The color was just beautiful. Ross had the beef kabobs. 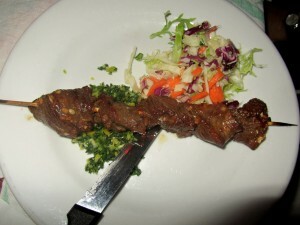 The rind of the orange and the combination of seasonings were tremendous; so tender. Soon we were ready for the main event. And this is how it went. I ordered the lamb. I wish I could remember everything he said. 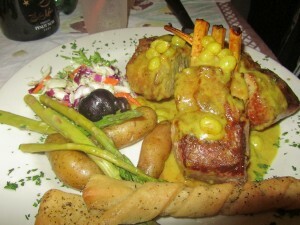 The lamb was a very big portion. It had chutney and raisins; a little Indian, maybe? A little sweet and tangy. I could not eat it all. 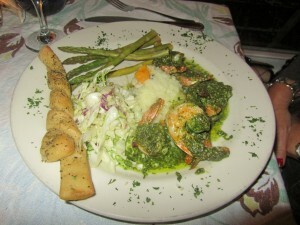 Served with a breadstick, which is the recipe that was used many years ago when they had pizza. 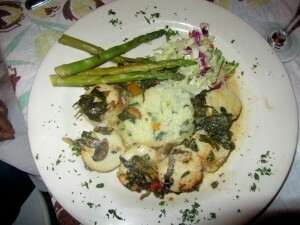 My husband ordered the scallops with risotto and asparagus. I have had them; very good, as well. Cindi ordered the shrimp. She was a happy camper. And, Ross orders the same thing every single time. The Duck. Well, he gave me a piece and I can now see why. 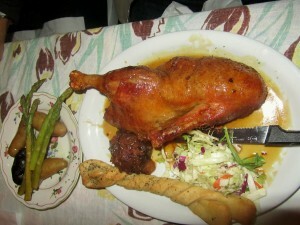 It was crispy and the sauce was tremendous; a semi sweet soy drizzle with an English cumberland sauce. I will have it next time. 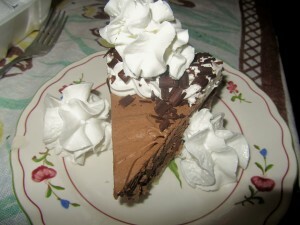 No room for dessert, except Ross ordered the chocolate pie. He asked for extra forks but he only gave me a bite. Smooth texture; if you like chocolate, order it. I am going to have to take a notebook next time to write the ingredients down. What happened was that between the talking and more bla bla bla, then, hello? It was over. You got the idea, though. Please note: The Grove Market is sensitive to customers with food related allergies. Since I started this blog almost 2 years ago I can tell you that the majority of the time I have had good meals; but also some lukewarms, as well. I give the benefit of the doubt and go again. Everyone can have a bad night. It is when those bad nights are consistent; then there is a problem. I guess I have been lucky or easy to please. Sharing a meal with friends is something else…I love it!! 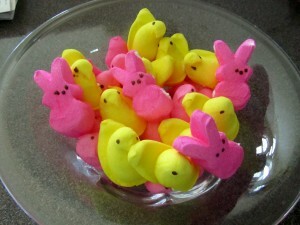 Peeps are Gluten Free and you can get them Sugar Free too!! The forecast does not sound too promising for our Beaches but nevertheless, there are Easter Egg Hunts that need to be taken care of. We cannot disappoint the little ones. 2 Separate Egg Hunts – One for ages 8 – 12 will start at 10 a.m. The hunt for ages 2 – 7 will start at 12 Noon. Location? 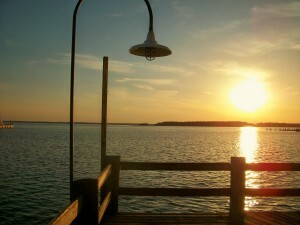 New Orleans St. Beach in Dewey Beach. Rain or Shine. Prizes or candy in all eggs. The GOLDEN egg will win 1/2 off week of skim camp. Call 302-227-7087, or e-mail alleyoopskim@hotmail.com to register. Please include child’s name age and e-mail address. You can also register on Saturday. All participants will receive 10% off in the Alley Scoop Shop, located at 2000 Hwy. 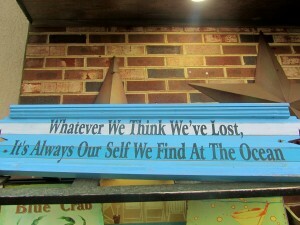 One, Unit 106, Dewey Beach. This is a skimboarding shop in business for 11 years. Website? www.alleyoopskim.com. 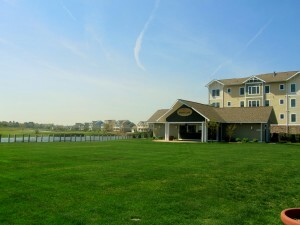 Sunday, 4/24 is the Easter Brunch and Egg Hunt at the Rusty Rudder located at 113 Dickinson St. 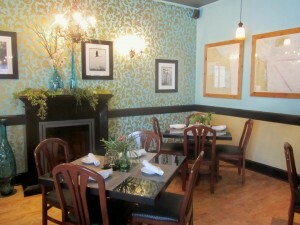 The Brunch will start at 10:00 a.m. and it is $16. Children 12 and under will pay $10 and children under 5 will pay $1 for each year of age. The hunt will start at 2:00 p.m. and it is free. There will be prizes and give-aways. More info? Please call 302-227-3888. Have a great Easter Egg Hunt….talk to you later…. 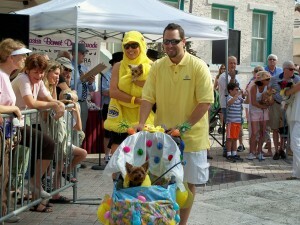 If you are visiting the Delray Beach area on Easter Week-End these 2 events will be worth it. They will put a smile on your face. It promises to be such a fun day. When? Saturday, 4/23 at 8:00 a.m. It is a free event. 8:30 a.m. The hunt starts promptly. Children 1 to 8 years of age are all invited to bring their Easter baskets and help Delray Beach Parks and Recreation hunt for over 10,000 eggs filled with candy and surprises. More info? Call Danielle Beardsley at 561-243-7277 or e-mail her at beardsley@mydelraybeach.com. 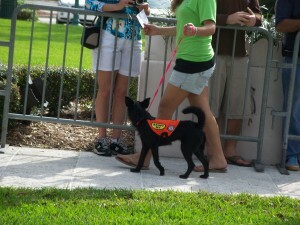 I am a pet lover and this event is histerical. 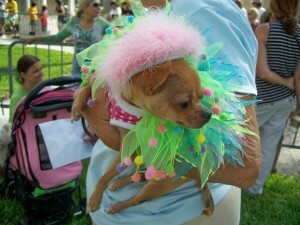 It is the 10th Annual Easter Bonnet Pet Parade on Saturday, 4/23. Hosted by the Delray GreenMarket. Registration 9:00 a.m. on the front lawn of Old School Square, 51 North Swinton. 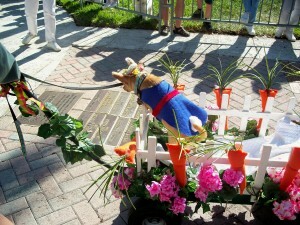 Parade begins at 10:00 a.m.
Best dressed animals and their owners will strut their stuff in the parade down Atlantic Avenue from the front lawn of the Cornell Museum to the GreenMarket on SE 4th Ave. If you want to see who wins, please stay because the judging will be for the Most Traditional, Most Original, Funniest, Most Frou-Frou, Most Tropical, and Owner-Pet Look-alike. Entry? $2 It is for a good cause; all proceeds go to the Animal Rescue Force. 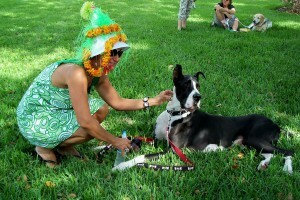 Afterwards, stay and shop with the vendors of the Delray GreenMarket and enjoy live entertainment. If you need more info., please call Lori Nolan at 561-276-7511. Have a great time!!! Talk to you later….